Smart dieting may now get a little easier with a special cup that can figure out the calorie count of what's poured into it. 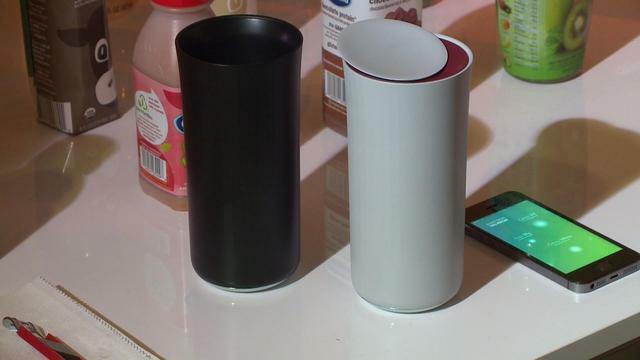 The Vessyl "smart cup" can detect the molecular makeup of a drink and track the amount of sugar, caffeine, protein or fat, CBS San Francisco reports. "When people track what they consume, studies have shown the likeliness of achieving your health goals is higher," said Justin Lee, CEO and co-founder of Mark One, the company that developed it. The cup can also send the nutritional drink data to a smartphone to help users keep track of their consumption. Small sensors in the cup examine the molecules in the drink to determine what's inside, the company says. "So whether it's a Coke, a Sprite, an Orange Crush, or a smoothie or coffee with half-and-half it knows at a molecular level," Lee said. The cup took seven years to develop, and will be available for sale next year. It can be pre-ordered on the company's website for $99.